As I am sure any of our readers know, here are Panel Bound, we are dedicated to promoting the independent comic community. As independent writers and artists, we know the dedication that printing a self published comic takes. The majority of indie creators I speak with, are doing it purely out of a love for comics. It’s not about money, and it’s not about fame, independent comic creators do it to tell a story beyond the boundaries of mainstream publishing. One of my favorite indie creators that I spoke with in 2011 was Skuds McKinley. Skuds is the writer and artist behind, I’ll Take You To The Moon and Leave You There, which is currently making rounds with distributors nation wide right now. I wanted to take some time to recommend this book to anyone looking to support the indie community. The last time we spoke with Skuds, I’ll Take You To The Moon and Leave You There was on it’s last leg of a successful Kickstarter campaign. I’ll let Skuds explain in his own words just what this books is all about. I’ll Take You To The Moon and Leave You There is basically a bunch of small stories collected into one big nice book. Vol.1 collects all of my favorite stories from my first two years of doing comics. the book shows a huge progression in art and story telling techniques, tackles a multitude of different genres, and has a lil something for everyone in it. I ordered a copy of Skud’s book a few months back and I can attest to the fact that this book does, in fact, tackle a ton of different genres. 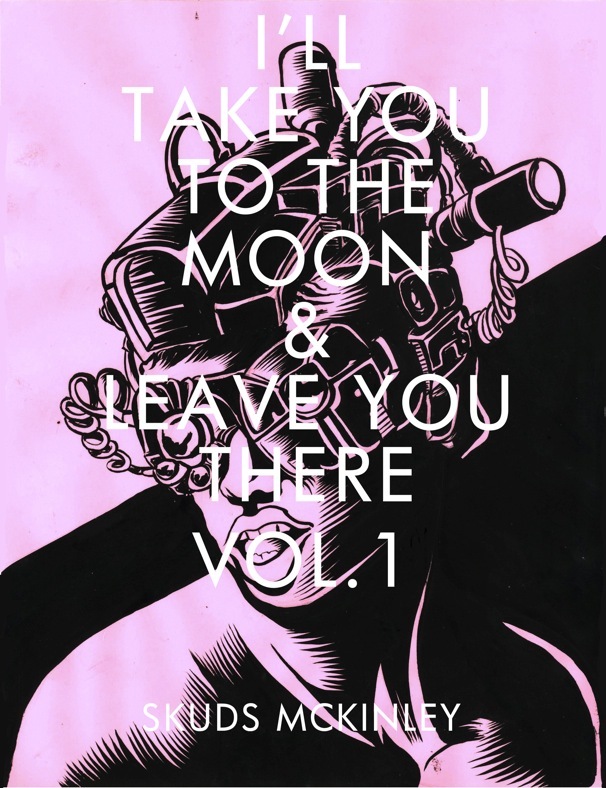 The first few stories in I’ll Take You To The Moon and Leave You There showcase an artist and writer wrapping his head around various comic techniques. From there on, the book is a study in drawing, sketching and inking reminiscent of Paul Pope and Charles Burns. Each story in this book is wrapped in the surreal that would inhabit out lives, if only we let it in. I’ll Take You To The Moon and Leave You There feels like the graphic novel equivalent of musical improvisation. Each story varies in depth and length that are straight from the darkest corners of someones subconscious. Consider reading this book like listening to a jazz album or Calculating Infinity for our Dillinger Escape Plan fans (god I hope there are some out there). I’ll Take You To The Moon and Leave You There is a 56 page long graphic novel that you can order from Skuds at his site BatShitArt.com. You can also head to his site to read every story in the book free of charge, but while your there pick a copy and support the indie comic scene. Any shops interested in I’ll Take You To The Moon and Leave You There can contact the books distributor Tony Shenton at Shenton4Sales [at] aol [dot] com. What is a Smog Test? Is Having a Hair Salon Challenging?